Concentric uses elements of its core technology building blocks to aid the design and development of unique solutions that answer a variety of key industry market drivers, namely energy savings and power density combined with lower noise. The company’s most recent development is an integrated combination of its patented dual cone clutch (DCC) and its Ferra series pumps. The Concentric DCC pump is designed to suit intermittent applications that demand high power density during work cycles, while offering savings in energy consumption when hydraulic power is not required, such as during travel times between operating cycles. The technology employs power-on-demand logic, which eliminates parasitic losses, thereby saving energy in transit mode when work functions are not being performed. The Ferra series cast-iron line of hydraulic gear pumps and motors was designed for robust, high-performance duty cycles and is therefore ideally suited for applications in the construction, agriculture, material handling and other mobile on- and off-highway sectors. Rugged and compact in design, the Ferra series products offer extremely robust performance across a broad range of pressure and temperature requirements. Following the acquisition of LICOS Trucktec GmbH in 2013, a variety of new technologies became available to Concentric. The patented DCC is compact in design and, with extremely low wear at the friction interfaces, is virtually maintenance free. Actuation of the clutch can occur either hydraulically or pneumatically and can be designed to include fail-safe modes of operation depending upon the application requirements. 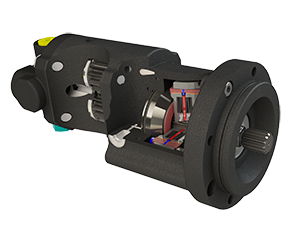 Like many other products in the Concentric offering, the integrated DCC pump product is modular in design, which allows for easy substitution of standard pump components as well as the addition of the clutch mechanism, which is bolted directly to the pump. The modular approach also helps to ensure the exact production standards required to deliver market-leading technologies cost effectively. The technology is easily scalable depending on the torque loads required by the application. Recent testing has yielded positive results in transmitting up to 140Nm of torque and power savings up to 3kW. Prototype units are available that can be customized to meet specific application requirements. There are many advantages associated with the integrated power-on-demand DCC product – not least the compact design that offers vehicle and system designers greater flexibility when competing for the ever-decreasing available space within the latest machines. Through its very nature of possessing the ability to be decoupled when not performing work, the resulting reduction of parasitic losses directly correlates to a drop in fuel consumption. The power-on-demand logic allows for additional benefits by decoupling auxiliary pumps to deliver improved startup capability, particularly in cold weather conditions, thereby requiring reduced cranking power. This opportunity may also allow for an overall reduction in engine size as a result of not having to overcome these parasitic loads at startup. In addition to these benefits, improved pump reliability is anticipated through extended pump life, which is accomplished by only running the unit when the work cycle requires. Furthermore, a reduction in environmental noise emission is also accomplished by turning the pump off when it is not being used. In fact, whatever the application might be, this new technology being offered by Concentric can be easily adapted to suit the demands of almost any vehicle.